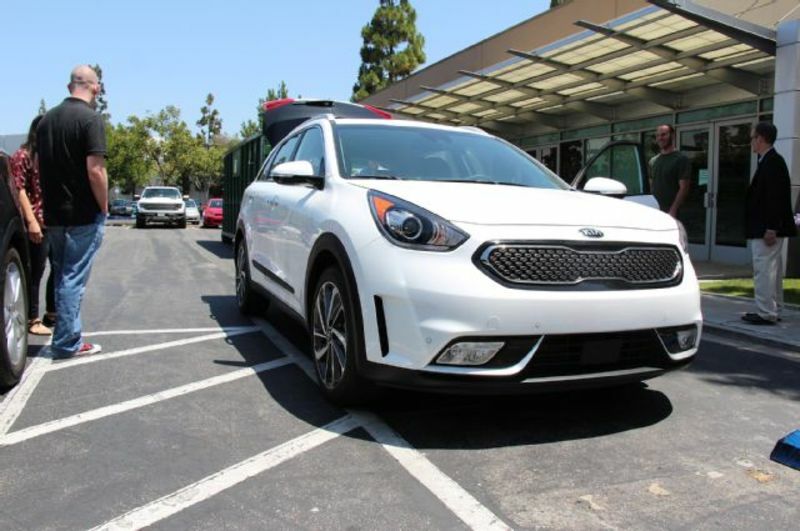 the guys at MotorTrend saw the model in person last week, Kia stopped by their office with the all-new 2017 Niro hybrid crossover. They were able to get a close look at the Toyota Prius competitor that’s set to go on sale early next year after the release of the Optima hybrid and plug-in hybrid. Their cool facts list didn’t mention much regarding the crossover’s driving dynamics which leads us to believe that they weren’t given a chance to drive it and this was purely a show and tell kind of meeting. During they discussion, they learned of eight new details about the 2017 Niro. Most hybrid vehicles already in the market were designed to optimize aerodynamics so they are generally wedge shaped and the designers at Kia didn’t want to follow this trend. They wanted something to set their first dedicated hybrid vehicle apart from the rest and thus the crossover/suv- like body. Kis calls this a "hybrid utility vehicle", something that is both practical and has enough interior space for the whole family. Just like the body, most hybrids comes with a continuously variable transmission (CVT) but Kia just didn’t want a belt-type transmission in the Niro. That’s why they equipped it with a six-speed dual-clutch unit instead so it doesn’t drive the same as its competitors. We know that the 2017 Kia Niro shares the same platform as the Hyundai Elantra and Kia Forte but, what we didn’t know was that it only shares 10% of the chassis parts with the other two models because the Niro was designed to be a hybrid only. Kia engineered the 1.6-liter GDI four-cylinder engine specifically for Hyundai and Kia hybrid applications so you won’t be seeing this Atkinson Cycle engine in anything but a hybrid. For those of you waiting for the plug-in hybrid Niro, your wait won’t be too long because it’s set to be revealed a few months after the standard Niro hits showroom floors early next year. If it’s similar to the Hyundai Ioniq, we could be seeing a pure electric range of 25 miles (40 km) or more. At least we won’t be seeing it anytime soon. The Niro will be front-wheel-drive only and the same would apply to the plug-in version too. In order to make it AWD, the platform would need to be changed to fit the system. Maybe one day we’ll see an AWD Niro with an electric motor fitted into the rear. Depending on the type of elevation you’re driving on; uphill, downhill, or on level ground, the Niro will use the navigation system and cruise control to anticipate topographical changes and adjust the energy flow as needed to optimize efficiency. Kia is the first company to adjust this system for both ascending and descending settings. The Niro was engineered to be fuel efficient at 50 mpg (4.7 L/100km) and even with a body that’s not wedge-like, it still only has a drag coefficient of 0.29. We can expect the starting MSRP to be around $25,000 USD which puts it on par with the Toyota Prius. That’s a long of bang for your buck. Starting at $25000? I can get a Prius starting at $24200 with proven hybrid system and 60 mpg. Way to screw up Kia. That depends on who you ask since to some people it will still look good, to some they might even look past its design and just take it for what it is. A lot of people are comfortable with the idea of buying from a certain brand over another, that alone can dictate their purchase. The same can't be said as much for Kia, although its growing. Kia is definitely growing, but is no where as followed as much as Toyota is. Toyota has long developed that relationship with the world for loyalty, reliability and it shows in their sales. This is gonna be an interesting one to see how the Niro is going to perform. The Prius has a non-existent trunk and extremely small rear seat. Those prices isn't what actually happened. Got my Niro for less than a Prius. i took a look at a Prius and was shocked at the cost. sure it did have a low starting price, but you pretty much had to load it up with extras to get a vehicle that you could drive. I did ask to take the absolute base model out for a test drive but the dealer didn't have any. I asked why not and he was upfront in that they don't sell them with anything less than the middle package trim car. That was the point that I liked with the Niro is it came pretty well equipped as standard. you really don't need to buy up. I did buy the model above base just because I needed a car in stock and not wanting to wait for one to get ordered because I didn't want two BLACK cars.